Dimensions: 4.96" x 4.96" x 2"
Waterproof Rating: IP43, Damp Location Rated. Can be used in showers and under soffits. ✔ SAVE 86% IMMEDIATELY. Save 86% on your energy bill by replacing 65W with 9W LED. 50,000+ hours of life. ● POLYCARBONATE TRIM. Innovative PC technology is impact resistant and outstandingly tough, even over a wide temperature range. PC helps to reduce glares, eliminate hot spots and soften light all without reducing lumen output. No change of color or rusting overtime as you would see with an aluminum trim. Advanced ALUMINUM heat sink for optimal heat dissipation allowing for extended lifetime. ● CERTIFICATIONS: ENERGY STAR certified which means our products meet strict requirements to be considered energy efficient and reliable. 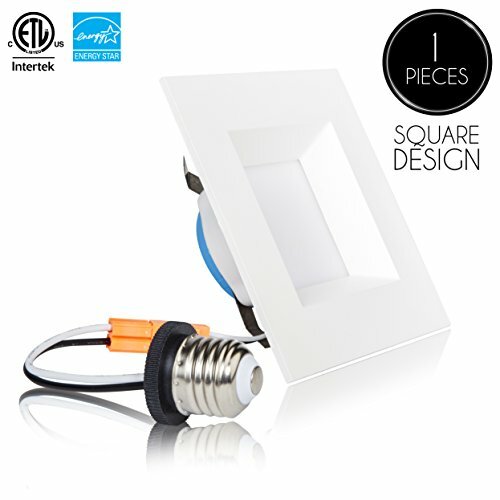 ETL-Listed to avoid electrical shock and fire hazard making our LED Downlights extremely safe. Additional certifications: FCC-Compliant, RoHS, Damp Location Rated.